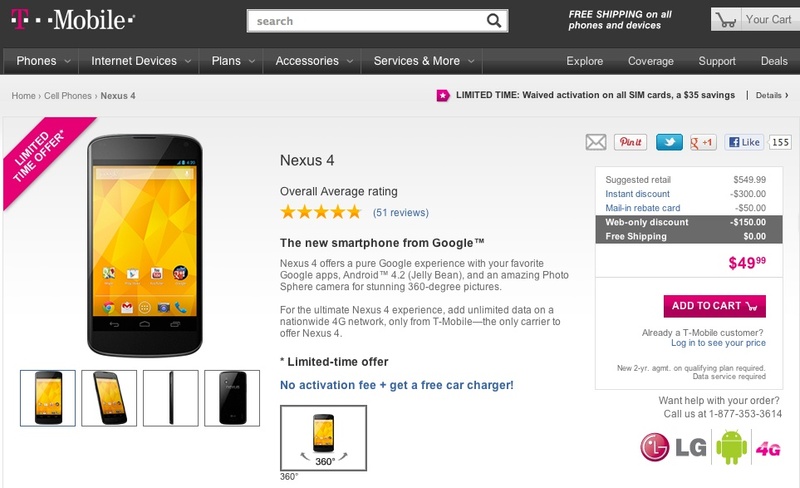 This morning, T-Mobile appears to have dropped the price of the Nexus 4 once again to one of its lowest points. While it’s not the full “free” that it was a couple of weeks ago, for $49 and a new contract, you can still walk away with one of the most talked about devices of the last 6 months. You can read our review here. The deal is a “web-only discount,” so that usually mean you won’t see this price in stores. We also aren’t sure how “limited” the deal is from a time frame standpoint. To add to the savings, T-Mobile is waiving activation on all SIM cards and tossing in a free car charger with purchase. And we likely don’t need to point this out again, but you can pay $349 for the same phone through Google Play and not have to worry about contracts.